The film is a genre bender as Big Daddy (Haig) fights against the government, to maintain his grow-op. Haig is also the producer on this grindhouse feature. Indican has slated the film for an initial theatrical launch. 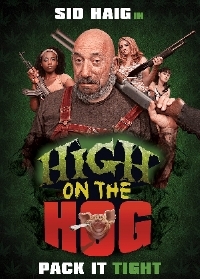 On April 19th, High on the Hog will show in several cities. Cities hosting the theatrical showings include Australia, Canada, the United Kingdom and of course the USA. Just picked up at the Berlin Film Festival, Indican expects a wider launch, on home entertainment formats, at a future date.